In our cheese factory we process the milk according to the tradition that has characterised for many years the quality of our products. Each step is carried out following the European regulations in matter of hygiene and safety. For this, our products can be exported all over Europe since they are in compliance with the European laws. We do not use any additives except salt to preserve the cheese. 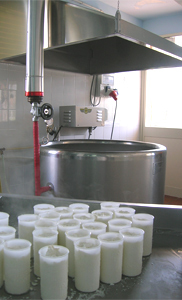 Going from the milk to the cheese production is a result of passion and devotion that we put in our daily work. All the processes have been optimised during the years and the experience we have gained is expressed in our products that represent an explosion of genuineness and typicalness.